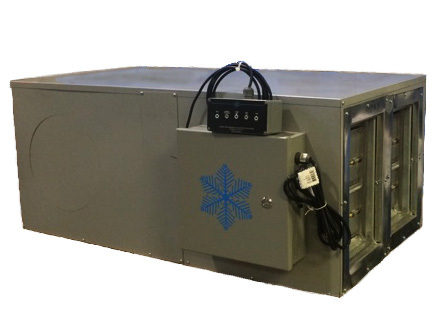 Introducing our proprietary, eco-friendly refrigeration system for commercial and industrial walk-in coolers. The Nordic Economizer is designed to supplement the mechanical system of walk-in coolers to provide efficient and consistent refrigeration with a fraction of the energy consumption. Our patent pending design can cut annual energy consumption by up to 50% or more and save customers hundreds or potentially thousands of dollars on their annual utility bill. Studies have shown that refrigeration can account for up to 60% of energy used by grocery stores, convenient stores, liquor stores, and many restaurants each year. While other technologies offer minimal savings (usually <10%), the Nordic Economizer can save up to 50% or more of your refrigeration energy usage. Decrease refrigeration repair costs & increase mechanical life. Commercial refrigeration equipment is a major investment for most businesses, and repairs can be costly. Protect your investment with a Nordic Economizer. It will significantly reduce the wear and tear on your existing equipment by reducing its run-time. Our economizer provides supplemental cooling, using only outside air. No additional refrigerant gasses are needed for our system. Rebates help cover the investment cost. Various rebates are available to help cover the costs of energy efficiency projects through most utility companies around the country. And we will gladly help you navigate them. Exceptional ROI! In most cases, customers will experience an investment payback in 1-3 years from the energy savings alone, creating an exceptional return on investment! Nordic has been your Rocky Mountain commercial refrigeration experts for nearly 30 years. For years, we’ve thought it was crazy to run your refrigeration system when its colder outside than it is in your cooler. That’s about as crazy as running your air conditioner in the winter or your heater in the summer. It just doesn’t make sense! Especially, when it comes to walk-in coolers since they are such a large consumer of electricity. In fact, refrigeration is the largest single consumer of electricity for most restaurants, grocery, liquor, and convenience stores. So what did we do about it? We invented the world’s first successful refrigeration economizer that uses free cold outside air to refrigerate your walk-in cooler! For the non-techs out there, we essentially created a ‘smart window’ that automatically switches your compressor off and opens a vent to the outside whenever its cold out in order to save energy and money. This green technology uses ZERO greenhouse gasses, reduces your annual electricity consumption, and decreases waste by extending the useful life of your current refrigeration system. With temperatures dropping below freezing for half the year in many places, there is a huge potential for electricity savings. We’re seeing applications that will reduce energy bills by $1,000+ annually, leading to quick payback and outstanding IRRs! Since most repairs are time sensitive and can vary in complexity, much of our service work is performed on a time and material (T&M) basis, where the customer pays for the time and material required to diagnose and repair the problem. Our regular service hours are 8am-5pm Monday-Friday, but we have a technician on-call 24/7 for emergencies. You are directly supporting both a U.S. manufacturing company and your local HVAC service company with every purchase and installation of a Nordic Economizer. Need equipment financing for your project? Our partners at Direct Capital offer comprehensive lending options with attractive terms and blazing fast turnaround!